Someone stealing an eBike has the problem of sourcing a compatible charger. The bike shops are aware of this and are very suspicious of anyone coming in wanting to buy a charger. With e-bikes now allowing travel at higher (and, as noted above, more dangerous) speeds, and having a higher monetary value, are we likely to see any regulatory changes to introduce user licensing and/or vehicle registration regimes for e-bikes similar to those for other powered vehicles? And would such moves be desirable? 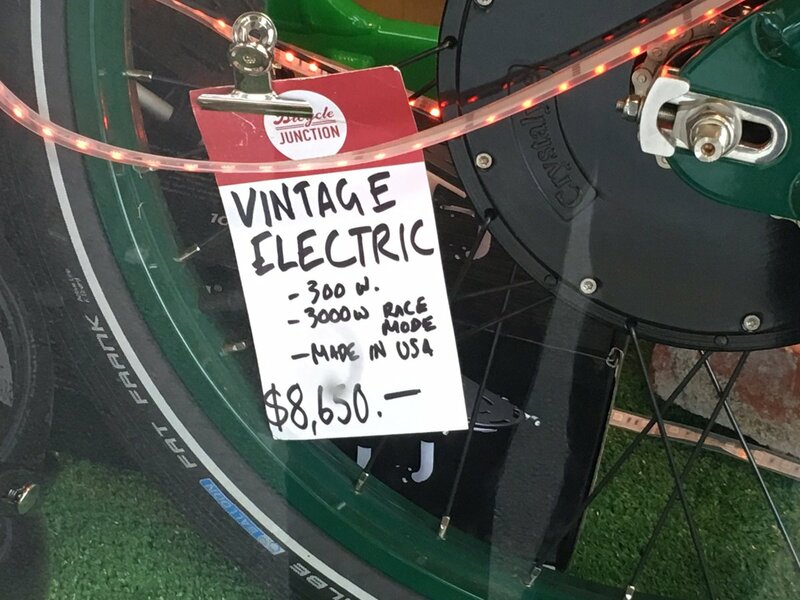 Currently e-bikes don't require registering if they're rated at 300 watts or less. If you wanted to go faster you'd need a more powerful bike which, at over 300 watts, would be subject to the same registration rules as a motorcycle. I know of at least one e-bike sale where not having to register a second vehicle made it a more attractive choice than a scooter. As for "higher monetary values", i.e. lifestyle bikes, influencing law changes, nah. Sounds like socialising the risks of a private benefit. Gentrification may have its upsides, but if you're spending up large you can presumably afford insurance, or move to a gated community. Yes, that's the law, but I think proving an e-bike was over 300 watts would be quite difficult for an officer on the side of the road. I actually registered a 300 watt e-bike I had and they were all bemused at the testing station. No idea what do do with it - in the end they pretty much had to just slap the approval on it, because they had no official tests to do. The guy made a show of testing the indicators and brakes, but it was not tested on any kind of machine because there is no law saying that it had to be. This was one of those cargo bike style ones. They certainly had no way at a testing station of checking the wattage, so you can be damned sure no traffic cop on the side of the road does. This kind of testing is usually done by the manufacturer, but there is no mandating of any official way of even reporting the wattage rating of a motor, so there would be no law against removing/scratching off any markings that identify the manufacturer's claims of the wattage. Furthermore there are ways of increasing the wattage. Any electric motor can be rewound either by DIY or by a professional armature winder. E-bike DIY types have been doing this for decades. All of which makes it very difficult to actually enforce any real power limits on e-bikes unless specific testing and official stamping become law. Also worth noting too. When the power of a vehicle is in the hundreds of kilowatts, and the weight is in thousands of kilograms, then differences in the weight of the passengers count for almost nothing. But on a bike, the weight of the rider makes a very big difference to the speeds that the power can deliver. I've had goes on lots of e-scooters that would make an acceptable form of transport for a person less than 70kg, and were utterly worthless for me, could not even go uphill at all. And lastly, of course, speed limits are a very blunt instrument too. While going 40km/h on an e-bike on the flat indicates an unusually powerful bike, I routinely go 50km/h on a normal pushbike going downhill. When I recently saw a guy coming up New North Rd to Kingsland and was clearly travelling at around 30km/h, he wasn't fooling me by pedaling hard. He was clearly riding an e-bike that was several times more powerful than anything I've ever been on. And would such moves be desirable? So, in conclusion, that's a tough one. They sit in a strange space between lots of issues. For starters, if you're serious about safety then a bike that's effectively as powerful as a scooter should require a motorbike helmet. But this kills the whole idea of you powering it yourself, because you'd get far too hot. On the issue of the increased danger, you could certainly argue that pushbikes are already pretty damned dangerous, and so the policy should probably be the same, but there is the issue that e-bikes may be more dangerous to people who are not the passenger than a pushbike is. I don't know of any serious evidence about this though, and I'm not optimistic about public policy being really guided by evidence, since it didn't seem to be on helmeting laws. It's more likely to be some high profile accident in which a pedestrian is seriously injured by an e-bike that turns out to be overpowered, and then there will be a moral panic. But probably nothing will actually be done, for all the reasons already given pertaining to the practical problems of e-bikes. We've kind of passed through this space one time before, too. E-bikes are not the first powered pushbikes, nor are they the strongest. Mopeds are literally the petrol analog to e-bikes. Putting a little petrol engine on is something that's been done for as long as there have been motorbikes. Naturally petrol engines can range from super-weak powers in the mere hundreds of watts, to several kilowatts. Beyond that, they become pretty clearly motorbikes sized. Faced with this kind of power range the dangers were obvious. A 3 kilowatt engine could snap a pushbike chain easily, sending it swinging a high speed. With that kind of easy power available it could be tempting to do high miles on the bike which would wear out all the parts far faster than you'd expect on a pushbike. Police have basically no tolerance for anyone they see riding one of these, even though at the low end they are effectively the same as e-bikes, just noisier, and with effectively unlimited range, since you can buy the $5 of petrol to fill them up at a servo. I guess there will come a point where the batteries are strong enough and the motors have become miniaturized enough that it will be hard to tell an e-bike apart from something as powerful as a high end moped. If that happens then it's hard to think that we'd just let them slip through without regulation. There’s also something a little bit nonsensical about having pedal power available on a bike with an engine ten times more powerful than the rider. 300 watts is already well over what all but the strongest humans can consistently deliver. If you have a 1500 watt engine, what is really the point of pedaling? Exercise? You’d have an equivalent machine in which your pedaling was simply impeded by friction like on a wind-trainer, and all of the motive power provided by the engine. In fact, for the purposes of exercise it would be better because the engine would not be interfering with how much resistance you were fighting. Which is not the craziest idea ever. If people want to pedal a wind trainer whilst commuting, far be it from me to say they should not. I think this is sort of how cycling purists see e-bikers. It’s not really a bike. It’s a bike like form of exercise that you can do on a motorbike. ETA: And as such, it is not so prey to geography the way normal pushbiking is. In Auckland on a pushbike I'm not really in control of how hard I have to work. On a wind-trainer, it's calibrated. I think this is sort of how cycling purists see e-bikers. It’s not really a bike. Maybe there are some twatcocks who view it that way but most cyclists totally get the value of e-bikes to the cycling community. Essentially the e-bike means my partner and I can ride together and both get roughly the same exercise. Together we now have roughly the same range which means we can see more and enjoy more on our bikes. That's true for a lot of people - the net result is more happy cyclists on the road which is good for the "purists" too - and they know it. Yes, I don't think many are disparaging more bikes on the road. The dominance of sports oriented cycling is rapidly fading. Essentially the e-bike means my partner and I can ride together and both get roughly the same exercise. Is one of you on an e-bike and the other not? Yes, that's the law, but I think proving an e-bike was over 300 watts would be quite difficult for an officer on the side of the road. Definitely. 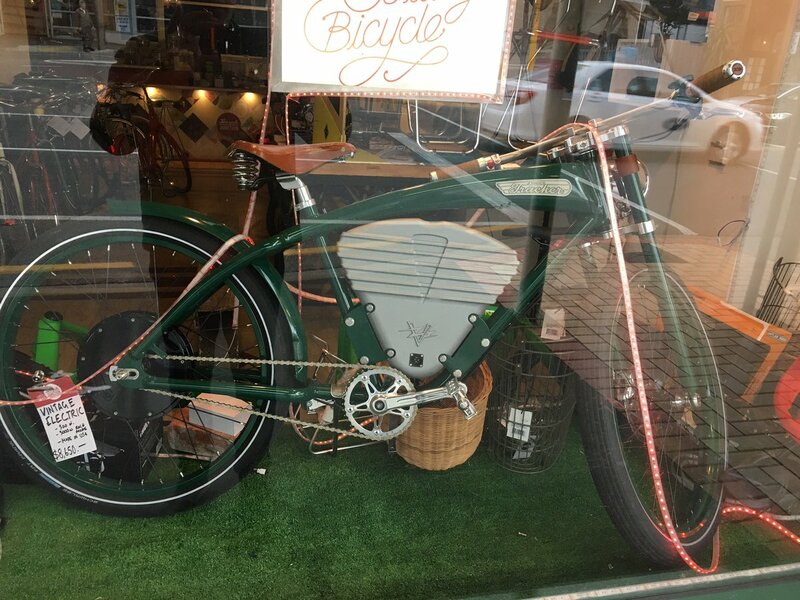 I've seen a home built lithium ion bike of around 500 watts hyped on TradeMe as being good to go without rego, because the seller claimed that an off duty cop had assured them that the law routinely turned a blind eye to such things. The one high-powered e-bike tragedy that I'm aware of doesn't seem to have prompted any suggestion of a real crackdown. Mopeds are literally the petrol analog to e-bikes. Putting a little petrol engine on is something that's been done for as long as there have been motorbikes....Police have basically no tolerance for anyone they see riding one of these, even though at the low end they are effectively the same as e-bikes, just noisier, and with effectively unlimited range, since you can buy the $5 of petrol to fill them up at a servo. Perhaps the annoying noise factor of some of those conversions has something to do with the law taking an interest. Getting around on a mountain bike with a rowdy Chinese engine probably fits the profile of someone who's lost their license. I recently saw a guy coming up New North Rd to Kingsland and was clearly travelling at around 30km/h, he wasn’t fooling me by pedaling hard. He was clearly riding an e-bike that was several times more powerful than anything I’ve ever been on. I think torque sensors make a difference – fitter riders will go faster. I pedalled hard up Chinaman’s Hill the other day and did 30km/h (although not all the way). PS: It's not actually vintage – that's the name of the maker. Yup. I'm on my Trek road bike, 100% doughnut powered. My partner on the Avanti E inc. We're pretty well matched at the moment but I suspect as her fitness increases I am going to get pushed quite hard to keep up on hills - but that's good for me :). 300 watts is already well over what all but the strongest humans can consistently deliver. At Yabun yesterday there was a gym dragging passers-by onto their wind trainer gadget. The girly was able to exceed 300W for a minute, burning a whopping 20 kJ. We'd just eaten lunch, so my initial 800W quickly dropped to 500W to avoid throwing up. But really, 300W is only a 50% increase over cruising along on the flat, so you'd expect anyone in good health who rides regularly to be able to hold 300W for a couple of minutes to get up a hill. Based on that and a bit of actual riding, I think 300W is reasonable. But even 500W for a single-rider, lightweight bike is getting silly. I would like to see a 1000W/25kph class, though, so that multirider and load bikes could legally use power assist. Especially when you start loading two or more kids into/onto a load bike, 300W stops being a lot of use on hills. It's great on the flat because it lets a normal rider accellerate away from stops as though the load isn't there, but on a hill they often run out of grunt quite quickly because the load bike gets hard to handle at low speed and then you're in a death spiral of wobble... back off pedalling to focus on staying upright... slow down.. wobble more... oh well. That's where the throttle systems come into their own, BTW, you can use them to help push the bike up the hill. I think that's the window of Bicycle Junction, on the corner of Adelaide Road and Riddiford street. That bike goes fast in race mode - at least 60kph if I recall correctly. That shop also does a nice line in folding Brompton bikes, which I have no real use-case for, but trip my geeky tech buttons something wicked. Re: the lock, people have no (general) issue spending ~10% of their car's value on an annual insurance policy (he says, having just reinsured his $9k car's comprehensive policy for $800), why treat your "expensive" bike any differently? Buy an expensive lock and you do two things: 1) make it hard for a thief who really wants it. 2) Make them not even bother and move on to the bike with a not-so-good lock. A top-end lock can be had for $100-200, and is worth every dollar if you're going to be leaving it in public. And of course, don't forget you can insure your bike. Some household policies will provide cover off the property either while in use (i.e. if you crash, the damage is covered) or not (i.e. stolen if locked up) either included in your policy as an extra. Well worth considering; I can budget $360/year for insurance, I can't budget $3600/year for a new bike. Finally, my last security tip is consider taking your seat (& seatpost) with you if you can, when you leave your bike. Firstly it makes it harder for a thief to ride it away; secondly a bike is less appealing if they've got to buy (or steal) another seat to make it hockable. And of course, photograph the thing and write down the serial number before you take it out for the first time. so you’d expect anyone in good health who rides regularly to be able to hold 300W for a couple of minutes to get up a hill. Sure, and you could probably crack a kilowatt for a few seconds. But the e-bike delivers that wattage for hours. You have to be well trained to manage that. That's pretty much what I'm comparing to - peak output is misleading. Your 800W is over a horsepower, but that does not mean you're as strong as a horse. A horse can generate a lot more than one horsepower. It's called a horsepower because it's how much a horse can generate consistently over a long period of time (I think it was a shift of lifting water in some horrible factory or mine). That's pretty much what I was meaning by the human ability to generate power. Peak power is not a useful comparison, especially since the motor's peak power output is pretty much the same as its average, since it doesn't get tired. I think you're right, that the 300W figure did get picked for a reason. It's like putting a strong cyclist on there with you in tandem who doesn't weigh very much. So if you just sit there, it's like they are carrying you and their own weight, and the whole thing is only going to go a little bit slower than what a strong cyclist on their own could do (depending very much on how much you weigh). 500W is more like putting Lance Armstrong on the 'roids on there with you and telling him all will be forgiven if he goes hard. Anything beyond that is inhumanly strong. At 300W If you add your own power and the motor's and you're not that strong, you're hitting the upper end of what humans are capable of. Probably most people who choose an e-bike are not super strong cyclists in the first place, quite the opposite. It's at its most appealing to those who are not. So, essentially, what I'm suggesting is that it's an amount chosen so that the bike is still mostly like a bike (albeit with a strong rider), rather than a motorbike. For the average rider that will use it, under average conditions. I would like to see a 1000W/25kph class, though, so that multirider and load bikes could legally use power assist. Especially when you start loading two or more kids into/onto a load bike, 300W stops being a lot of use on hills. Interesting idea, to use mandatory speed limiting as the control. If that were effective it would probably eliminate the worst danger. But getting a bootleg controller would be something I can see being popular, particularly with 14 y.o. kids, who would absolutely fly on a 1000W bike. The one high-powered e-bike tragedy that I’m aware of doesn’t seem to have prompted any suggestion of a real crackdown. No, although she did only kill herself. I was kind of suggesting a moral panic following an e-bike killing, say, a pedestrian. In that particular accident, there were multiple contributing factors, including very poor eyesight. Any bike at all will surely be extremely dangerous to the rider, under those conditions. Extremely sad, though, and it seems highly likely that the vehicle's power was a contributing factor too. Perhaps the annoying noise factor of some of those conversions has something to do with the law taking an interest. Well they do draw attention, for sure. Also you'd have to think that it's a little bit more dangerous just on account of the potential for the petrol to ignite in an accident. And that “3000 watt race mode” looks … interesting. It did look very similar to your Pacer, although this was a few years ago now. The rider was dressed in motocross gear, all in black, with a full face visor. By the time he crested the hill right in front of me I'd guess he was going more like 40. Raced past silently like some kind of bicycle ninja. If you're in reasonable shape but she's untrained then you can bet she's got a lot more room for improvement! Naturally it's the hills where the difference will be evident. That was what I always noticed when riding along keeping pace with a pushbiker. They'd get ahead on the flat, but on hills I'd be reeling them in. Quite a lot of that might have been aerodynamics, though, my bike was upright so wind friction on the flat was significant, whereas with the slower speeds on hills it's all about the watts/weights ratios. Hence the observation by the grumpy cyclist getting overtaken effortlessly on a hill that they're not really up against someone doing the same exercise as them.